Six years in the making for Italian occult Black Metal artists, OPERA IX, “The Gospel” is purportedly based on the book “Aradia and the Gospel of the Witches,” by Charles Godfrey Leland, which documents an infamous group of pagan witches that were said to practice their black magic in Tuscany. The founder of the band, Ossian, who handles guitar duties, produced the album with Federico Pennazzato, drummer from legendary Italian occult band DEATH SS. Yes; the occult is strong with this one. I recall hearing OPERA IX when I was first getting wind of the Symphonic Black Metal scene in the late 1990’s. Of course, they had already been around since the late ’80’s, but by this time they shared many qualities with bands like DIMMU BORGIR, including “Phantom of the Opera”-style keyboards combined with raspy Black Metal vox, and tended to mimic the slow doomy goth style played by Peaceville bands like PARADISE LOST and ANATHEMA, with added Pagan Folk elements that made them stand apart. At this time, the band was one of the most successful Italian exports in the metal music scene, and was poised for further breakthrough before dissolving in the early 2000’s. Ossian forged on with the band, facing an uphill battle since, with the last album “Strix (Maledictae In Aeternum)” released in 2011. The spirit of OPERA IX is still alive on this disc, with all the hallmarks of the classic sound, including orchestrations, choirs, ethereal voices and atmosphere to go along with fiery blast beats and Doom-laden gothic melodies. Yes, they’re back. But, do they have anything to add to their legacy? In the opener and title track, we’re introduced to new vocalist Dianaria who is in full on Black Metal spell-casting mode. He does a nice job throughout balancing being downright scary while also remaining intelligible. The song is multi-layered, starting with a Folk Metal melody, utilizing some classic Transylvanian organ flourishes. The baroque intensity builds into a nice blast section that gives way to an acoustic piano before returning to a Folk Metal dash at the end. “Chapter II” starts slow with more occult theatrics and settles into a nice driving pace with a swirling melody of tremolo picking perfect for some healthy movement in the pit. “Chapter III” showcases some nice effeminate vocals, while Charon, on bass, has a solo moment about four and a half minutes in, leading to a groove section that is highlighted by some exceptional drumming from m:A Fog. It’s a rare organic moment on an otherwise structured affair. “Moon Goddess” starts off just about as you would expect it to, with a beautifully atmospheric soliloquy, until it subverts those expectations with a lightning-paced speed riff that cuts through the core of the song. “House of the Wind” brings it back to a doomy pace that gradually rises to an AMON AMARTH style melodic battle charge by the end. “The Invocation” starts like a barnburner with an almost CHILDREN OF BODOM feel and some tasteful chiming keys underneath a tremolo picked verse. Transforming into a mid-tempo head-nodder, it delightfully showcases what OPERA IX can do as far as crossing genres in a moments notice. “Queen of the Serpents” goes back into full-on stomping CANDLEMASS Doom with some simple riffs that hold and resonate to great effect. The outro absolutely slays (and this album has a lot of them.) “Cimaruta” is a nice Black Metal reverie with some ethereal vocals and moody keys at the front. The closer “Sacrilego” is a furious maelstrom of Symphonic Black Metal, like the devil himself has been unleashed. It’s an exclamation point on what is a top-notch statement album. 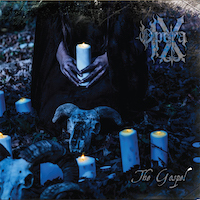 Now finally reaping the benefits of the modernized production that many Folk and Black Metal purveyors have enjoyed since OPERA IX first took the stage ages ago, “The Gospel” has the feeling of a catch-up record for the band. You won’t hear much you haven’t heard before, but it utterly succeeds at proving they can still bring it like the many relative newcomers, and some may say pretenders, have since.